This was one memorable trip for me. I visited Bhutan recently and met with dear Jigme, school Principal at Changzamtok Lower Secondary School and her husband, Karma Gayleg from the Early Childhood Care Development (ECD), Ministry of Education. 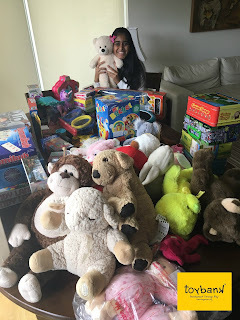 They are super wonderful people and all of us at Toybank are really lucky to have them help take toys to as many children in Bhutan as possible. 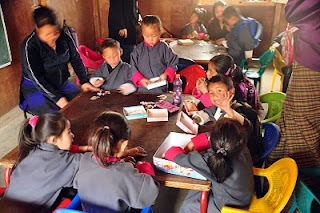 I visited Toybank's center in Jigme's school and was immediately overwhelmed by the sight of so many children playing with toys given to them by Toybank. These toys were used last year by children who now have been promoted to Class I and are currently being used by children in Pre KG. 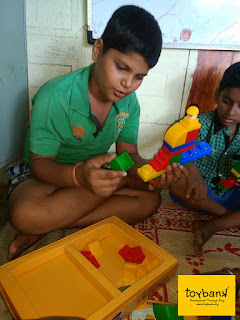 Parents and teachers were all equally involved in getting the kids to understand the game and play it with one another in a healthy way..
"I taught children the names of vegetables using the toy vegetables that Toybank gave us" said an enthusiastic teacher from this class. The toys are neatly arranged in the same order by teachers and parents and kept safely in a cupboard within this play room. They value these toys so much as they do not know when they'd receive more toys again. After watching and playing with some of the kids, I am now determined to send hundreds of more toys to not just this one center but dozens of more schools and ECD centers across all of Bhutan. Thank you to Toybanker Ashima who is a true reason behind setting up Toybank in Bhutan! Happy Toybanking to everybody! Click here to see more smiles that we have captured during our visit to Bhutan.